"Don't swing angry!" as my golf buddy, Joe, is fond of saying. Usually, he mutters this sarcastic statement after I just three-jacked the previous hole. Ironically enough, some of my straightest, longest drives come when I'm fuming over a three putt. This Rage Driver makes no bones about encouraging you to take an angry, ferocious swing. 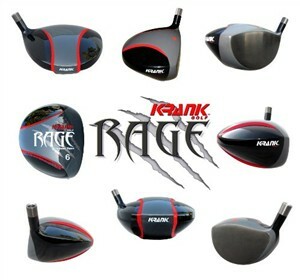 The company Krank has a good record of developing big distance drivers. Their last driver won two consecutive Remax World Long Drive Championships. That's a pretty good resume. Make sure you get both feet off of the ground when you swing this monster 460cc beast. Besides the wild graphics with the word "RAGE" painted on it, it also has some cool technology. The "Impact Technology" provides the club with both vertical and lateral support. This helps reduce twisting when you make impact swinging at Mach 1. Krank says this has the highest ball speeds of any driver they've made yet. Not only that -- they claim it is the most accurate as well. They only build these drivers with the Fujikura Diesel Shaft, and you can get one as long as 47 inches. Wow, you power junkies must be drooling on your computer screens by now.